When we first opened our new offices in December of 2008, we were extremely proud of our efforts to plan the perfect space and atmosphere for our patients suffering from chronic pain. After 12 years of working in other facilities and rented spaces, we had a place to call our own. My then budding photographer daughter, offered her services and Doc chose some of her best work, and we covered our walls with 50 plus of her framed photographs. The photos below hang behind our front desk. One particularly crabby woman, we’ll call her ‘Mabel’ came in for her appointment. She snarled at the receptionist, was short with the intake nurse, and by the time she got to the procedure room, with me and Doctor, she’d only begun to find things to complain about. 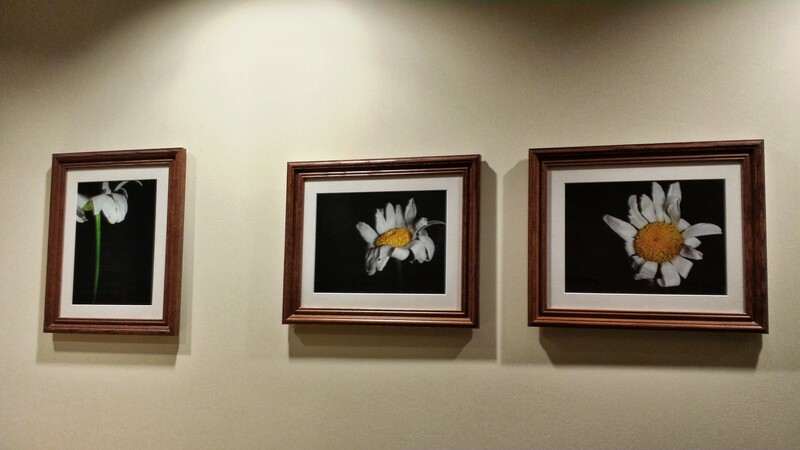 While I was prepping her back, she felt the urge to tell me that she did not understand WHY ON EARTH we would have photos of “crappy daisies” in our lobby. Doc’s eyed widened as he looked toward me, knowing, I’d take this as personally as any Mother Bear might, sensing an attack on her offspring. My face reddened, but I bit my tongue. Doctor then went on to explain to “Mabel”, that while those daisies may not be perfect, they’re a perfect example of our very selves, imperfect, yet beautiful beings, if we only stopped and took the time to notice. Chief Complaint (1/2): This 81 year old female presents today for follow-up evaluation of lumbar pain. Chief Complaint (2/2): She also presents for Lumbar Epidural Steroid Injection. The patient reports 10% relief from the previous injection. Patient states that the injection hasn’t helped much. She isn’t too happy. Her knee catches and her right leg swells. She also complains of charlie horses and our pictures of imperfect daisies.